Our 16 oz. 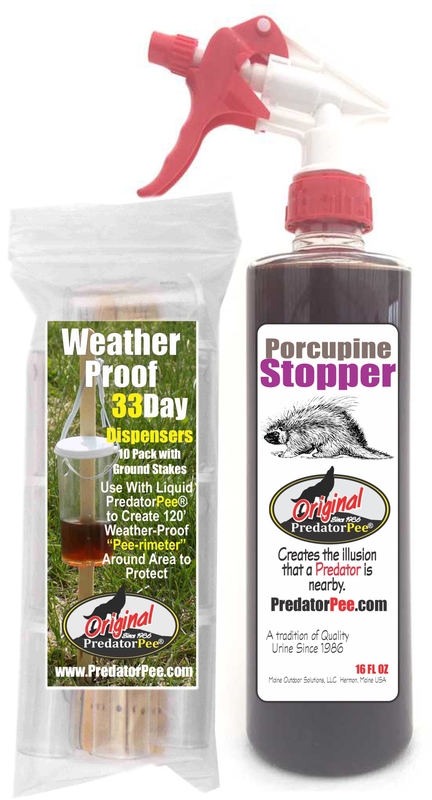 PorcupineStopper and dispensers includes a trigger spray bottle of porcupine deterrent spray and a 10 pack of our weather proof 33 Day Dispensers at a great price! Hang the dispensers every 10-12 ft using the included twist ties and ground stakes. Fill with about an ounce of “pee” to create a long-lasting “pee-rimeter” that is protected from wind and rain - Big Savings when you buy multiples!